As always, I want to be clear and this is why I reiterate a point made often on this blog: No one wants to see pets suffer and die in sub-standard conditions. It makes no difference to me whether these dogs are being warehoused for breeding in a “puppy mill” or warehoused for killing in a “shelter”. Causing suffering and needless death for pets is wrong. Full stop. The American Kennel Club (AKC) has never done anything to make me believe they care one bit about dogs suffering and dying anywhere. Neither has the Humane Society of the United States (HSUS). And yet the two are frequently pitted against one another by reporters seeking “both sides of the story”. Newsflash: it’s the same story. [Wayne Pacelle] says that while most AKC-registered breeders are probably fine, they’re seeing too many bad apples, from Montana to North Carolina. In some cases, those breeders are even convicted of animal cruelty. “Most” are probably ok but some are bad – even to the point of animal cruelty. Gee Wayne Pacelle, have you ever heard of this system of pet killing facilities we have in our country? They deceptively call themselves “shelters” and you know, “humane societies” when in fact they are causing pets to suffer and die. “Most” are not fine. In fact most are killing healthy/treatable animals – the ultimate form of animal cruelty. And the directors of these pet killing facilities are keeping puppy mills in business. We checked the HSUS tax records Form 990. It shows the non-profit took in over $133 million in donations last year. Of that, $6 million went to local shelters. So what does the Humane Society spend your donations on? Primarily fundraising, advertising, legislation to protect animals, and the lobbyists to push it through. What else does the Humane Society of the U.S. spend your donations on? $17.3 million on lobbyists between the years of 2005-2009, more than it gave to local animal shelters in that time. In a letter, half a dozen congressmen called for an IRS investigation into HSUS’ tax exempt status. Tax exempt organizations are prohibited by law from attempting to influence legislation on a large scale. In a response, the IRS confirms to a congressman that it’s investigating, but wouldn’t comment on what, if any action it may take. The reporter states that for 3 weeks, Wayne Pacelle declined the station’s requests for an interview. We are not all on the same team. I am for no kill which means pets suffering and dying anywhere is unacceptable to me. HSUS and AKC are both on Team Screw The Pets, Show Me The Money. No TV? Animal Cruelty Laws Don’t Apply to You! An Ohio farmer named Jonas Beachy has been charged with 23 counts of animal cruelty after authorities seized 52 dogs from his farm on October 1. 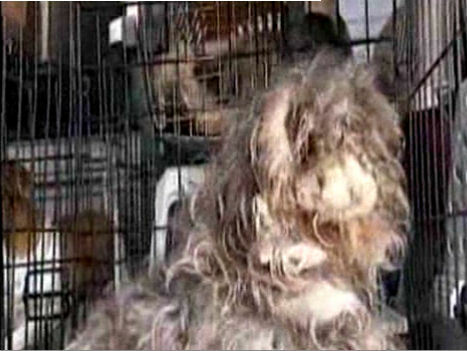 The dogs were allegedly severely matted, suffering from untreated injuries and living in filthy conditions. Mr. Beachy says he cares for his dogs and they were seized due to the fact that he is Amish and there are cultural differences at play. “We don’t have TV and we don’t listen to the news,” Beachy said. “I was not aware that I was violating any laws whatsoever,” he said. Right. Because TV and radio news are the main sources most Americans rely upon to make ourselves aware of laws. Apparently Mr. Beachy sees no problem with a dog living in this condition. Because TV! Screengrab from the NBC 4 website showing one of the dogs seized from Jonas Beachy. Mr. Beachy says that he has since read the applicable OH laws and determined that he “did not violate any laws”. His first court appearance is scheduled for November 27. There are not nearly enough shelter pets for everyone in the U.S. who plans to get a pet this year. This is ok because some owners, about 1.5 million, are already set on an alternate source (a breeder usually) for the new pet they plan to get within the next year. Of course many, about 5 million, are determined to adopt the pet they will be getting this year. Since we have an estimated 8 million pets entering shelters in this country every year, we have plenty of animals for these 5 million owners to choose from. But there is a third group of people, about 17 million, who are planning to add a pet to the family within the next year and are open to the possibility of adopting from a shelter as a source for that animal. We have only about 3 million shelter pets left in the total estimated population who are healthy/treatable and available for adoption. As is plain, if we were to convince even half of these 17 million homes to adopt from a shelter, we would be coming up short by millions of animals. Even if we adjust our estimates (to allow for a tough economic situation) and suppose that there are a million more pets being taken in by shelters this year and a million less homes intending to add a new pet, we still wouldn’t have enough shelter pets for even half of those open to adoption. So why are an estimated 3 million healthy/treatable shelter pets being killed each year? Obviously there are more than enough homes for them so that is not the answer. Are we failing to get the message out to enough of the target market that shelter pets are good and adoption is a positive experience? I don’t think so. While marketing is an ongoing effort, I believe we’ve done well in this area – definitely well enough to convince at least 3 million people who were already open to the idea of adoption anyway. The short answer is this: The reason 3 million healthy/treatable shelter pets are going into the dumpster each year instead of home with people who want them is because shelter directors are killing them instead of doing their jobs. 1. Shelter staff and volunteers drive the public away by blaming them for various mythical crimes such as failure to neuter and pet overpopulation. People are further driven away when they know the facility kills animals and every pet they look at might be taken to the kill room if they don’t adopt him. It’s too overwhelming for compassionate people to enter this kind of environment. And of course no establishment is going to attract customers if the service is lousy, the place stinks and/or the merchandise is displayed in the equivalent of a dungeon. 2. Shelters and rescue groups turn down applicants they deem unfit for pet ownership. 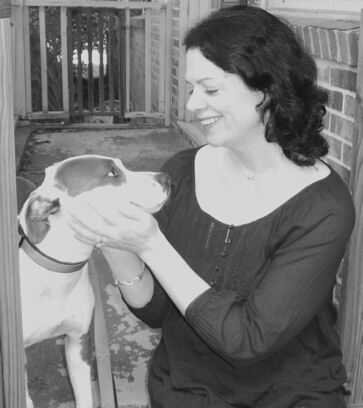 While I support having adopters providing a picture ID and a completed adoption application so they can be checked for prior animal cruelty convictions, I find it objectionable to deny adopters for such reasons as having a job, not having a fence, having children, or being unable to pay a $350 adoption fee. 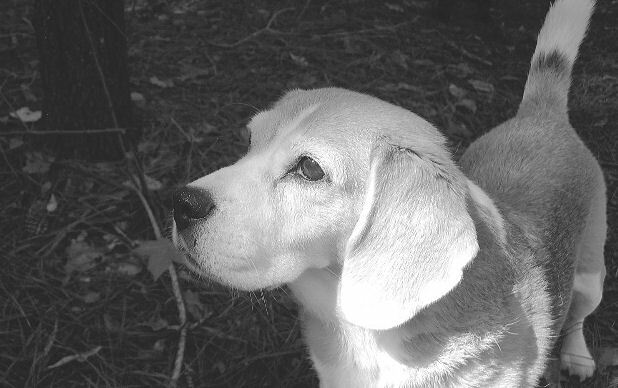 It is not possible to determine the quality of life a pet will have by using an arbitrary list of criteria such as is commonly used by many shelters and rescues. There are responsible pet owners who will never lose a pet regardless of fence quality, type or lack thereof just as there are responsible pet owners who will lose a pet regardless of fence status. Similarly, there are irresponsible pet owners who work outside the home just as there are irresponsible pet owners who work at home or are unemployed. By refusing to let pets go home with the people who want them, shelters and rescues are keeping cages occupied that could otherwise be freed up to save the next pet in need. Recently I heard a teenage girl being interviewed on a TV show. She said she practiced Satanism. When asked why, she responded, “Because it’s the only religion that accepts everyone.” Setting aside my own religious views, I have to admit she makes a good point. No one wants to be harshly judged or rejected. And as with religion, pet owners have the freedom to choose where they will get their pets. You know what groups in the pet world “accept everyone”? Pet stores. Irresponsible breeders. People giving away dogs and cats online or in parking lots. The people being turned away by shelters and rescues will get pets from somewhere, probably a source that does not provide continuing education and assistance, and they will likely move into the group who will never be open to pet adoption. Win? For whom? 3. Shelters don’t allow adopters to see, touch and fall in love with their pets. Some shelters are never open to the public for adoptions, others are only open when most people work. Some facilities only allow visitors to see a portion of the animals there and/or don’t allow adopters to touch the pets. All, some or none of the animals may be posted online for adopters to see using good, adequate, or horrible photos. Every shelter, especially those in low traffic locations, should be bringing animals to daily offsite adoption events in high traffic areas but many hold no offsite adoptions whatsoever. The bottom line: If people can’t see the animals, how will anyone be able to save them? 4. Shelters are killing animals based upon arbitrary criteria such as breed, coat color, heartworm status, age, weight and number of days spent in the facility. By assuming for example that people don’t want Pitbulls, or that there are too many tuxedo cats on the adoption floor already and therefore marking these pets for killing, they are unavailable to be adopted by people who want them. It sounds obvious, I know. Somewhere out there right now, I imagine there is an adopter looking for a tuxedo cat because he wants to adopt a kitty and he happens to fancy tuxedo cats. There are plenty available in shelters so no problem, right? 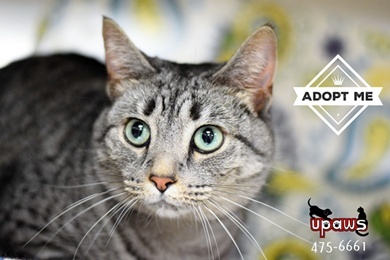 Let’s say this adopter only wants to adopt a pet he meets in person and feels a special connection with. So he visits his local municipal shelter. They do in fact have two tuxedo cats but he doesn’t make that connection with either. In the kill room however, they have just killed a tuxedo cat (for being one too many) who happened to be a very vocal pet. The adopter’s last cat was also a talker and in fact, had he met this one, he would have likely felt that special connection he was hoping for and adopted him. My point being that shelter directors have no way of knowing which particular animal will cause an adopter to fall in love. By operating on the assumption that they do know, they are preventing pets from being matched up with the people who want them. Contrary to the belief of shelter directors who kill based upon arbitrary criteria such as coat color, adopters are not looking for any pet whose fur is of a particular color – they are looking for an individual pet that appeals to them in a unique way. The more pets available for adopters to meet, the greater the likelihood they will find that special animal they want to take home. You know how this owner will be able to meet lots of tuxedo cats? 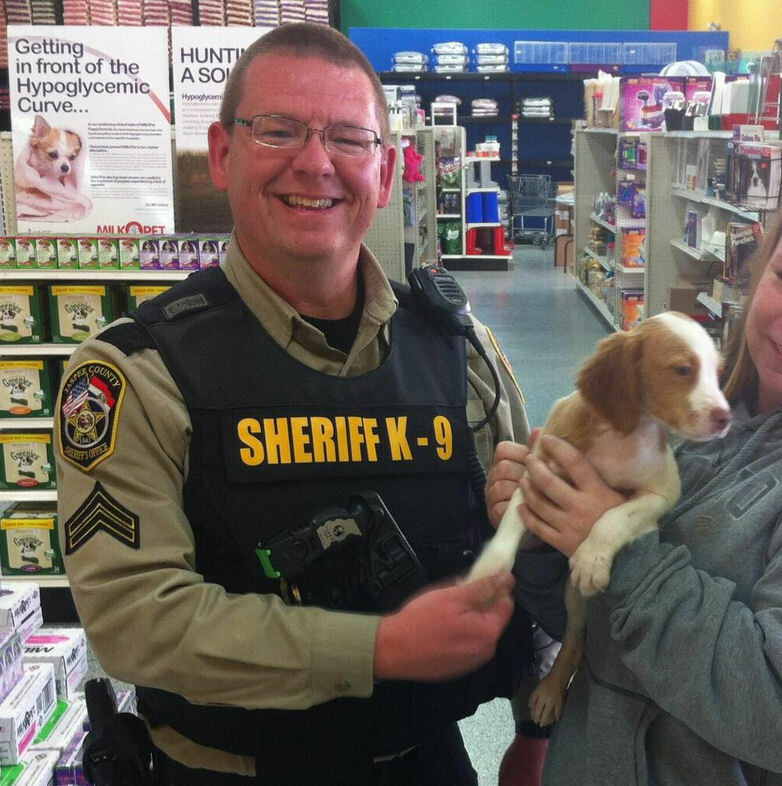 By visiting every pet store in the county. And the more he meets, the greater the chance he will fall in love with one. 5. Shelter directors see killing as an option for controlling the population. If a compassionate director committed to saving animals’ lives was put into place at every pet killing facility, killing healthy/treatable pets would not be an option. Instead, the director, staff and volunteers would have to work their tails off to get animals out the door alive by any responsible means. This is what the directors, staff and volunteers at open admission no kill shelters do every day. It’s hard work that requires dedication, creativity and flexibility but it is the only ethical approach toward shelter population control. By killing the approximately 3 million healthy/treatable shelter pets that an estimated 17 million people planning to get a new pet are open to adopting, shelter directors are driving those 17 million people to other sources. Pet stores (supplied primarily by puppy mills) and profit driven breeders stay in business because there is a reliable market for their products. As long as there is a profit to be made, these undesirable sources for pets will remain plentiful. Killing healthy/treatable shelter pets ensures that puppy mills will continue to meet the demand for pets that shelters are not. If shelter directors would do their jobs and start getting every healthy/treatable pet in their care out alive, the demand for pets from alternative sources would be reduced. Put into simple terms, if shelters really want people to adopt, they need to let them. Remind me again how the so-called irresponsible public is to blame for shelter pet killing? My outrage-o-meter is seriously overloaded. Like the needle is shaking in the red zone and little puffs of smoke are seeping out accompanied by the occasional spark. Seneca Co, NY: A puppy miller with a disturbing track record of problematic USDA inspection reports (pdf) was told by a USDA inspector at the June 29th inspection to address the issue of Brucellosis in his kennel. When the inspector came back on July 15, the puppy miller, David Yoder, informed the inspector he had indeed dealt with the contagious disease situation: by putting his dogs, 5-6 at a time, into a whelping box, Rube Goldberg’d into a gas chamber via an exhaust pipe and a 3 horse power farm engine. He couldn’t stay to monitor what level of suffering the dogs endured while being gassed because, you know – there were fumes and stuff and the puppy miller got a headache. So Mr. Yoder left them to die in view of the main kennel dogs who also suffered from the fumes. He came back after a bit to remove the bodies and put the next batch in for killing. In all, Mr. Yoder killed 78 dogs and 15 puppies in this manner. Mary Anne Kowalski, a board member of the Seneca County SPCA, said she was not aware of anyone from the USDA reporting what she believes is a clear case of animal cruelty to local authorities. Kowalski, who discovered the report of the gassing on the USDA website while updating her files [on September 13], said she was stunned at what she read. “I just lost it,” she said. Kowalski said she reported the incident to the sheriff and district attorney in the hope that cruelty charges will be brought against Yoder. Barbara Yoder said today that USDA inspectors had urged them earlier to euthanize their dogs because they had contracted brucellosis, a bacterial disease that can also be passed to humans. She said the USDA inspector “scolded” them for not having put the dogs down sooner. Pennsylvania: I’m not going to attempt to cover all the details of the case against Almost Heaven Kennels which resulted in the owner, Derbe “Skip” Eckhart, being sentenced to 6 to 23 months in jail on cruelty and related charges this year. Bill White of the Morning Call has been covering the story for years. I plucked some details from a couple of his columns to give you a taste of Almost Heaven. A whistleblower who worked at the kennel for several years explained that Mr. Eckhart instructed her to sell puppies, no matter what she had to do to make the sale. She went along with this practice of lying to customers, knowing it was wrong, because she says she wanted to get as many dogs as possible “out of that hellhole”. The rest of the 800 animals reportedly lived in appalling filth. Mr. Eckhart was ordered by the court at one point to stop accumulating dogs – an order he violated – and even tried changing the name of the kennel and listing his assistant as the owner on the website. At trial, Mr. Eckhart’s attorney had an answer for everything. The kennels were filthy because authorities had locked Mr. Eckhart’s employees out during the raid, preventing them from cleaning. 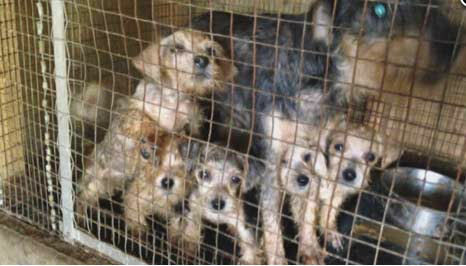 The dogs in the worst shape at the time of the seizure were rescues who had arrived only days before. Basically, Mr. Eckhart is a hero who just can’t say no to helping any dog in need. He’s guilty of having too big a heart. They jury, on the other hand, found Mr. Eckhart guilty of cruelty and failure to comply with the cease and desist order. He began serving his sentence in May. On day four, Mr. Eckhart assaulted a prison guard. His lawyer has an explanation for that, too: His client was detoxing from all the prescription drugs he’d been taking. In fact, Mr. Eckhart doesn’t even remember what happened, seeing as he was in such a fog and all. Now, after serving just a few months of his sentence, Mr. Eckhart wants out. He feels he should get probation, his sentence was too harsh, blah blah blah. The judge is set to make a ruling on the request in future. If denied, Mr. Eckhart will seek release on bail, pending an appeal of his conviction. I’ll be interested to see if the judge decides to keep the Bastion in prison. Thank you to Heather H. for alerting me to this story.